Step back in time to a simpler day when chocolate bars were a nickel and quick transportation was that of a train! Though dating from the late 1800's, the sprawling, 7500 square foot structure has only been at its present site since 1924. Built by a railroad company near the Curtis station to serve as a passenger hotel, the building was moved to its present location after the lumber boom for the tiny community located between two inland lakes, bringing homesteaders to the area and increasing logging activity. Owned by B.H. Cook, W.L. Curtis and Charles E. Miller, the firm moved its logging and milling operations from Petoskey, building a large sawmill and stave-heading plant in Grand Marais. 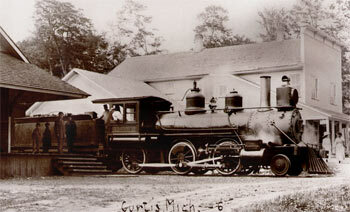 The company owned large tracts of hardwood timber in the Curtis area and the Manistique Railway extended its line from Germfask to Curtis so timber could be transported to the company mill in Grand Marais. By 1906, the extension to Curtis and several other communities enabled the railroad to travel over 90 miles of main line and branches, and transport 17,300 passengers in one year. Through the flurry of logging activity, the large wooden passenger hotel continued to accommodate travelers, homesteaders and logging personnel, offering them shelter and a place to eat. The railroad eventually discontinued service in 1909, and the last passenger train ran from Grand Marais to Curtis on Nov.5, 1910. In 1922, the Stack Lumber Co. of Escanaba purchased the line from Seney to Curtis, using it as a logging railroad for another 10 years, but hauling no passengers. Thus, the doors of the Curtis railroad hotel were permanently closed. In 1924, 15 years after the final train rolled through Curtis, the old hotel found new life when it was purchased by James Ostrander. Like many buildings of its era, the structure was solid enough to be rolled on logs and pulled by horses when its new owner decided to move it to its present location. 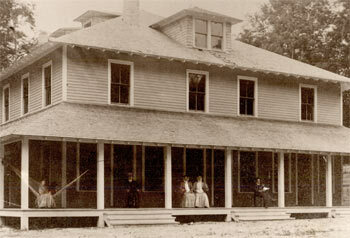 Ostrander renamed the hotel the Forest Inn, and operated it as a seasonal fishing/hunting resort. Accommodations at the resort were rustic, with a summer kitchen used to prepare the simple meals of fish pulled from Big Manistique Lake. A motorized tow boat was provided to take out and bring in the fishing boats. At the end of each day, wooden chairs and benches were pulled around the ornate floor-to-ceiling stone fireplace in the living room area as guests shared fish stories by the fire. Heat was limited and the hotel was shut down each year shortly after deer season. Ostrander operated the business until 1955, when he sold it to Vic Litzinger. Litzinger continued the seasonal operation of the hotel, catering to the many fishermans and hunters that annually flocked to the area. In the early 1970's, Litzinger decided to sell, and for the next 15 years, the once busy resort remained empty as a succession of owners came and went. It wasn't until 1989 that current owner Bud Chamberlin stumbled across the secluded structure while snowmobiling in the Curtis area. Chamberlin spent two years refurbishing and decorating the building, as well as updating the electrical and plumbing systems and roof. A full-service kitchen was also installed. 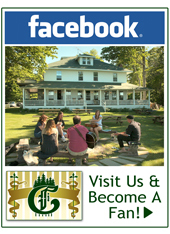 Chamberlin's Ole Forest Inn officially opened in October of 1990 as a bed and breakfast, offering guests overnight accommodations and breakfast. The restaurant portion of the Inn was opened on May 2, 1992. Open year round except for April, the Inn currently has 11 guest rooms and a spa room, each individually decorated in Victorian-style designs. Seven of the rooms have a private bath, with two of those seven having a jacuzzi, while the other four share baths. Much of the original woodwork that was the signature of the late 1800's remains throughout the Inn, as well as many of the antiques and furnishings that were sold with the house.